Shop our selection of christian bracelets and pick one to proudly wear as a symbol of your faith. There are plenty to choose from in our catalog for men, women and children. 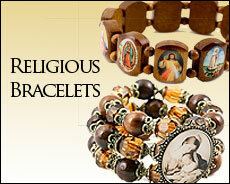 The religious bracelet category is very popular among our customers. There is a healthy variety with Catholic specific saints and more general Christian themes as well. So, find a bracelet that matches your style and personality from 100s of different designs. Choose metal, wood, glass or plastic finish in many colors. Show off this piece of religious jewelry in church or in your bible reading group. People will notice it and they will notice you. Majority of bracelets are stretchable for easy fit and comfort. Shopping for Confirmation, Baptism, Communion or Catholic Wedding bracelet? No problem, we've got you covered. There are many designs available for each of these special occasions. If you need help, just call our great sales stuff at 800-741-7754 for free advise.